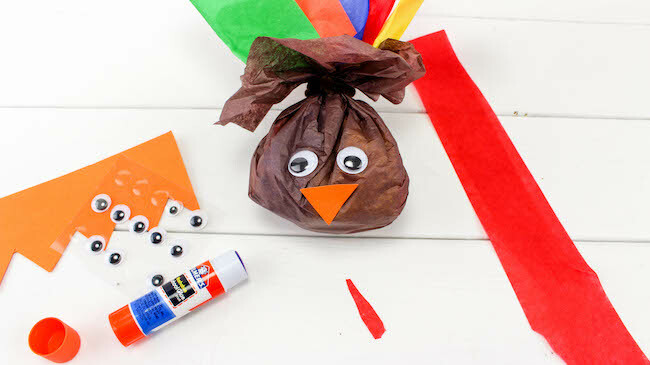 The Stuffed Tissue Paper Turkey Craft is brought to you by Just Plum Crazy. 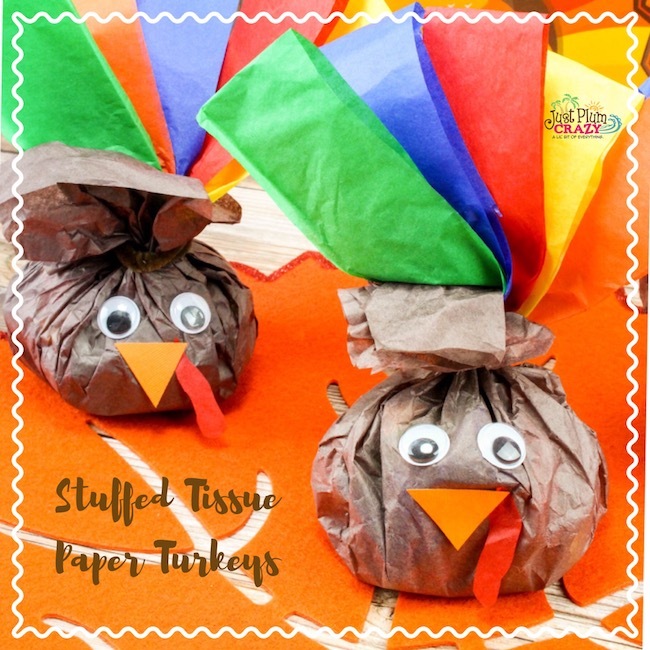 Stuffed Tissue Paper Turkey Craft! I’m thankful for the memories that Thanksgiving brings. Those long ago days when I was a child, when my mom and grandmother cooked such wonderful-smelling food. I love those memories, and I’m thankful for those memories. 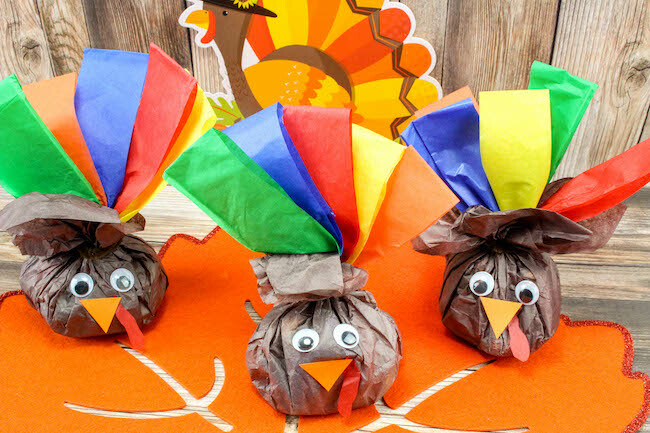 These Candy Stuffed Tissue Paper Turkey craft can also be filled with small pieces of paper with things you and/or the kids are thankful for. You can pretty much put in them whatever your imagination wants to. 1. Cut 6 pieces of the brown tissue paper into 12”x 12” squares. 2. Cut 6 strips of tissue paper of each of the other colors into about 1 ½” x 18” and fold each of these in half. 3. Cut 6 tiny orange triangles from the orange paper. 4. Lay out one of the brown paper squares. Lay 5 different colors of the paper strips on the center of the top half of the brown square. 5. 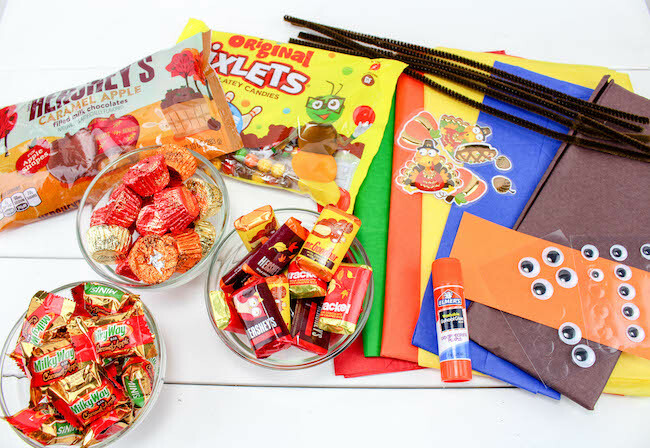 Set a pile of candy and stickers/toys in the middle of the brown square, partially covering the colored strips. 6. Gather up the corners and edges of the brown paper and bring them together around the pile of candy. Make sure the colored strips stay tucked inside the brown paper, but they need to stick out the top of the brown after you bring it all together. 7. 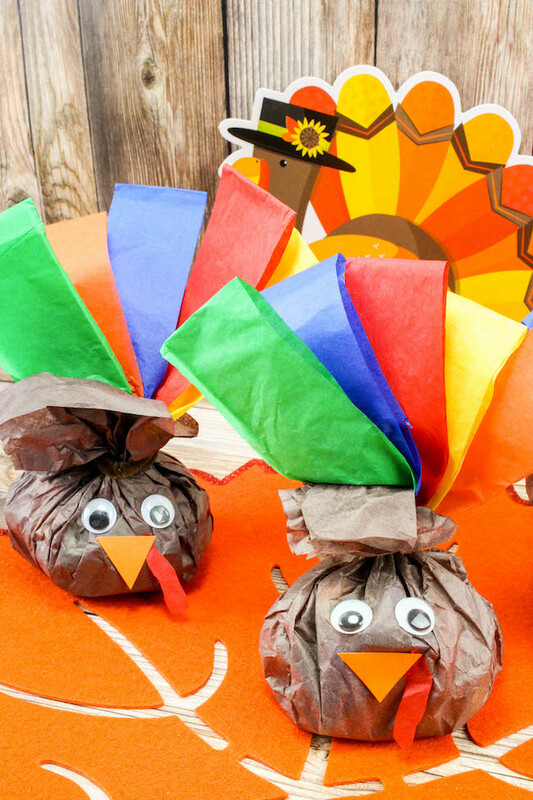 Take the pipe cleaner and tie it around the brown paper just like you would tie a bag closed. Twist the pipe cleaner and cut off any excess. 8. Glue 2 googly eyes and an orange beak on the front. You can add a small piece of red paper to resemble a wattle if you would like. 9. Repeat steps 4-8 to assemble all the turkeys. 10. Great party favor for kids! Cut 6 pieces of the brown tissue paper into 12”x 12” squares. 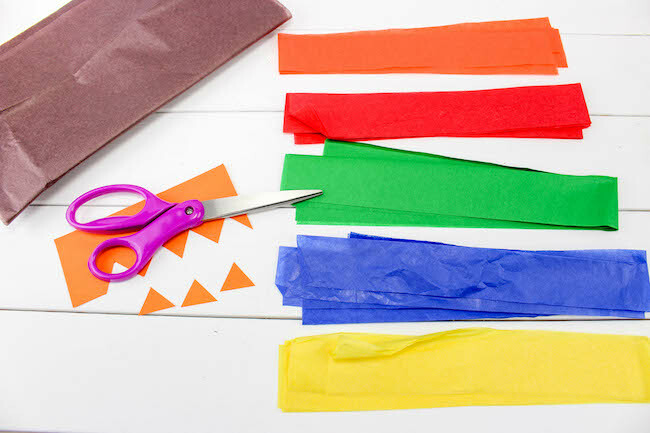 Cut 6 strips of tissue paper of each of the other colors into about 1 ½” x 18” and fold each of these in half. Cut 6 tiny orange triangles from the orange paper. Lay out one of the brown paper squares. Lay 5 different colors of the paper strips on the center of the top half of the brown square. 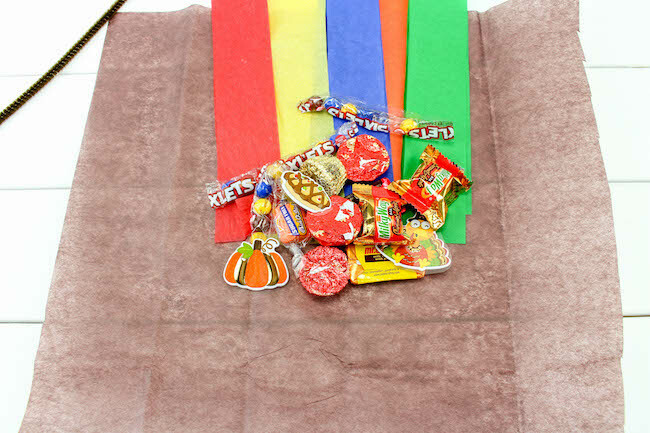 Set a pile of candy and stickers/toys in the middle of the brown square, partially covering the colored strips. 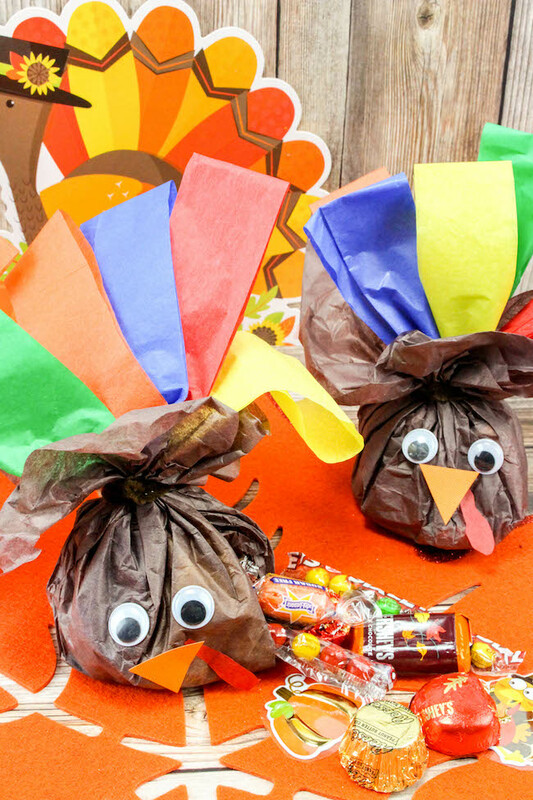 Gather up the corners and edges of the brown paper and bring them together around the pile of candy. Make sure the colored strips stay tucked inside the brown paper, but they need to stick out the top of the brown after you bring it all together. 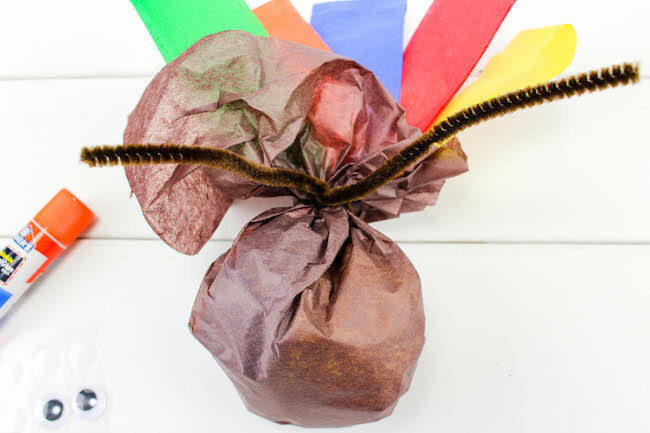 Take the pipe cleaner and tie it around the brown paper just like you would tie a bag closed. Twist the pipe cleaner and cut off any excess. Glue 2 googly eyes and an orange beak on the front. You can add a small piece of red paper to resemble a wattle if you would like. Repeat steps 4-8 to assemble all the turkeys. Great party favor for kids!